Cinemark Tinseltown hosted special showings of the 1982 fantasy film “The Dark Crystal” this past week, the theater nearly full for the opening matinee on Sunday. The audience tittered with excitement as the movie opened, with many adults having brought children to share in the incredible world of Thra, the foreign planet where the story of the crystal unfolds. Inhabited by nonhuman creatures and warmed by three suns, Thra is a beautifully crafted landscape so detailed it seems tangible. The planet resembles Earth, and though the wildlife is based on the forests of Earth, every species is unlike anything found here, rendered incredibly lifelike due to the use of groundbreaking animatronics and puppetry. When told after the film that the plants and animals weren’t animated, a 9-year-old viewer stood in shocked silence for a moment, saying, “I don’t believe you, how else could they do it?” He was even more stunned to learn that countless hours were spent on the construction of props and the programming of animatronics, in order to seem real. The story itself follows an elf-like being named Jen, who is part of the fictional Gelfling race and thought to be the last of his kind. Meanwhile, it was the cruel rulers of his kingdom, the Skeksis — hideous, decadent monsters who adhere to the power of a broken gem — who decimated his kin. Raised by the Skeksis’ opposites, the kind, multi-armed Mystics — who adhere to ancient, natural magic — Jen finds himself thrown into a dark and beautiful adventure after the death of his master. The wisest of the Mystics, this master’s final request of Jen was for him to heal the crystal that gives the Skeksis their power and restore balance to the world. Directed by Jim Henson and Frank Oz, the duo primarily of Muppets fame, “The Dark Crystal” was marketed as a family movie, though the material touches on dark topics that present philosophical questions about death, power, and the balance of good and evil. Genocide of the Gelflings and the enslavement of another sentient species in Thra —Podlings — present powerful examples of real-world pain. These harsh blows are offset by the gorgeous sets and the detail of the puppet characters. One is so busy marveling at the film’s cinematography, the horror is less profound. A few children in the theater cried out at the ghastly faces of the Skeksis, but they were soon giggling at the ridiculous banter and poor manners that trademark the species. Henson and Oz masterfully place comic relief when it is most needed, and the special-effects alone make the film a work of art. 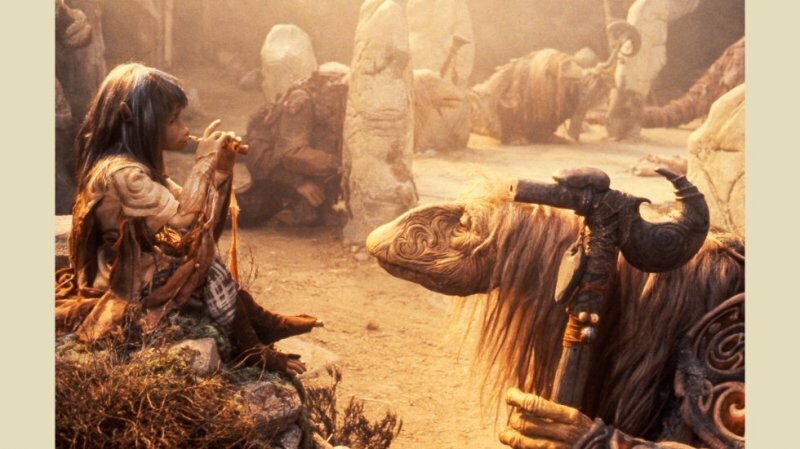 Equal parts beauty, sadness and comedy, “The Dark Crystal” is a treat for all ages.